In the 20th century the Catholic population in the City of Coventry had grown in its size and also become more widely distributed as the boundaries of the city expanded. 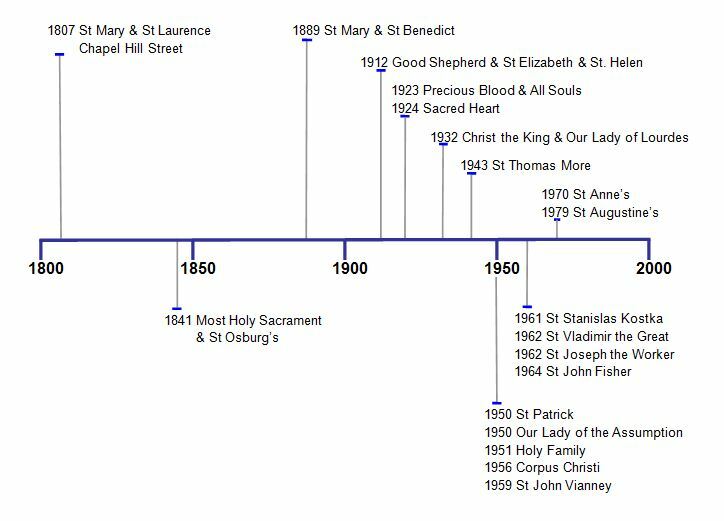 The Archdiocese of Birmingham had already formed several new parishes in the 1940’s and of 1950’s to serve the increased Roman Catholic population, when it was decided in 1956 to create a new parish for the south east of the city. It was Fr. Peter Tuite who was chosen to form this new parish to serve the communities of Willenhall, Stoke Aldermoor, Ernesford Grange, Binley, Binley Woods and Whitley. We remain indebted to him for his vision, energy and drive. We are also indebted to him for the parish dedication to Corpus Christi, which he requested shortly after his arrival in October 1956. Fr. Tuite quickly set about the task of building up the parish by visiting the known Catholic families in the area and they in turn would then tell him of other Catholics in the locality. He originally celebrated Mass in the Chace Hostel in Willenhall and in the Pinley Community Hall, as well as a monthly Mass in the Brandon and Binley Woods area of the parish. He was keen to find a site to build a new church and school. The council offered him a good-sized piece of land in Ernesford Grange, an area that had been earmarked for future housing development. It was an isolated site, beside the railway line and surrounded by fields. The only way to get access by car was to drive all the way through Willenhall and under the railway bridge. The original plan was for a building to be erected that could be used as a church until sufficient funds could be raised for a new church to be built between the presbytery and convent. This building would then become the parish hall. J. Lynch of Brierley Hill drew up the plans and design of the building and work began in 1957. It was opened and blessed by Archbishop Grimshaw on the 2nd October 1958. A month after the completion of the church, work began on the building of the school. The school was ready for its first intake of children in September 1959 and was blessed when Archbishop Grimshaw returned to the parish on 14th December of that year. Sr Sabina Staff was appointed as head teacher and other Sisters of Charity of St Paul came to teach in the school. The next stage of the development of the site was for the presbytery and convent to be built and work began at about that time. Records tell us that the presbytery was completed in 1960 and the convent in 1961. It was with great sadness and heartache that shortly after moving into the presbytery Fr. Tuite was asked to go to Ss John and Martin parish in Balsall Heath, Birmingham. There was even greater sadness, a few years later when the parish learnt of Fr. Tuite’s death, when he was aged forty-six. In gratitude for Fr. Tuite’s dedicated ministry and all the work he did in building up the community, the parish meeting room was later named in his memory. Fr. Michael Glynn became parish priest in 1961 and oversaw the continued development of the parish and the school, which mirrored the expansion of the area and rapid increase in population. On September 1st 1964, a new infant school was opened with seven new classrooms and Sr. Teresa Moore was appointed as the new head teacher. Sr. Sabina became head of the junior schools. Both Sr. Teresa and Sr. Sabina were instrumental in helping the school gain an excellent reputation in the city that has continued to the present day. In the early 1970’s, the parish was divided when Fr. Tony Taylor was appointed to form a new parish dedicated to St. Anne to serve the people of Willenhall and Whitley. It meant Corpus Christi parish lost many of those who had been at the heart of its development and been vital to building up the life of the community. Also in the early 1970’s a new social centre was built, between the presbytery and convent, on the site that Fr. Tuite had envisaged for the church. Following Fr Glynn’s departure after thirteen years in 1974 for Sacred Heart parish in Aston in Birmingham, Fr. Connell Harkin became the parish priest. This was a very memorable period of time for the parish as we celebrated the ordinations of Fr. Bob Wright on January 15th 1977 and Fr. Thomas Farrell in 16th July 1983. Also Pope John Paul visited the country in 1982 and celebrated Mass and the Sacrament of Confirmation at Baginton Airport, just a few miles away. Fr. Harkin left Corpus Christi after nine years in 1983. He returned to St Mary and St Benedict in the Hillfields area of the city where he had once been a curate. Tragically he died in a gas explosion in the presbytery. The beautiful stained glass window that was installed in the church during his time here as parish priest, was named in his memory. Fr. Harkin’s successor was Fr. Philip O’Reilly who came from Our Lady of the Assumption parish in Birmingham. He remained as parish priest until he retired to Ireland in 1993. Towards the end of his time plans to amalgamate the Infant and Junior Schools were drawn up and Sr. Teresa and Sr. Sabina ‘retired’ to their motherhouse in Selly Park in Birmingham. Ms Eileen Callaghan was appointed to succeed them as the new head teacher of the one school. Fr. O’Reilly was the first parish priest to work without a curate. The parish had grown used to seeing many different curates come and go. In the 1960’s and 1970’s there was often three priests living in the presbytery. The first curate in the parish was Fr. David Hutt, who arrived in 1960 and worked for a short time with both Fr. Tuite and then with Fr. Glynn before leaving to serve in another parish in 1963. The parish was also served by the following curates: Fr. Christopher O’Brien (1963–69), Fr Frank Parks (1963–64) and Fr. Thomas Cummins (1964–66), Fr. William Madden (1966–71), Fr. Finbar O’Hagan (1970), Fr Sandy Brown (1971), Fr. John Gunn (1972–79) and Fr. Patrick Gilsenan (1979–83). Fr. O’Reilly was succeeded by Fr. Brendan O’Malley who came from the parish of St Anne’s in Chelmsley Wood, Birmingham, where he had spent thirteen years. In his time there he had overseen the building of a church and presbytery. He used his experience in Birmingham to decorate our church here and bring in new furnishings and stained glass windows. Fr. O’Malley remained as parish priest until his retirement in July 1999. Fr. O’Malley was succeeded by Fr. Adrian MacNamara who came to the parish in July 1999 after spending time as West Indian Chaplain and Chaplain to the Birmingham Children’s Hospital. With their new priest, the parish entered into the Holy Year 2000 and shared in that privileged and historical moment of commemorating the 2000th anniversary of the birth of Jesus Christ. It was a time when the whole Church was called to reflect upon the mystery of the Incarnation and how God had fulfilled the promise to send a Messiah to bring salvation to the world.